I've been looking on the net for about 3 weeks now for an accurate PCB layout that I can use for etching and schematic to the original version 2 18v power boost. Nearly every search lead me to a 9v Overdriver layout or schematic. I know the differences in the circuit are minimal, but the end result is like night and day. The power boost for the uninitiated has a much larger amount of headroom before the gain kicks in, therefore the boost in volume is cleaner, where the Overdriver breaks up earlier and acts more like a common or garden overdrive pedal. 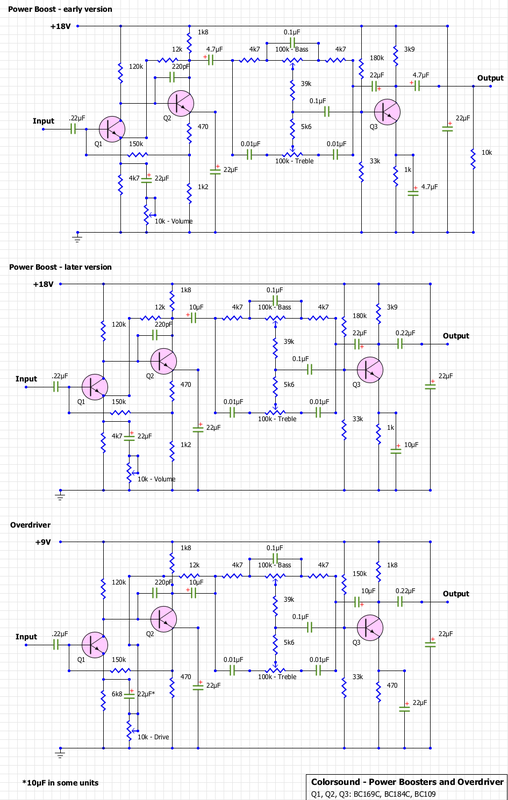 What I'm looking for is a printable PCB layout, and the correct period circuit diagram for an 18v power boost. The best diagram I've found so far on the net is this one, the later version is the one i'm interested inas that was probably the one that Gilmour used That later version. Has anybody ever built this version..... And what are the pit falls if any are there with the build. As an aside... n the macaris picture the Blue cylindrical 22uf caps.. Where would I get those from? The brand looks like Vishay.... Just curious where I could source those from. I guess you'll have to draw the circuit board yourself. Photos of the trace side are around..
Building it just like that may be harder than you might think as you probably can't get the right pots. Colorsound has to custom order them. used my '72 Power Boost as a reference. The PCB is a copy of the final 18V version with PP3 batteries. (I think the first one was a reverse board, second was the normal way up, but had the 33k in a different position and no terminal for the common battery connection. EW thinks this third version came about with the switch to PP3 batteries, which makes sense). 258 Pots are sourced from Omeg, custom made. I've gone with a reverse log pot for the Volume. The original ones had a linear pot, but the reverse log gives a better sweep - I think your standard ones have reverse log too? Transistors are BC184L, as in my original. So the volume is a reverse log pot.... No news on the value although the schematic reckons on a 10k. The schematic suggests 100k for the other 2 pots. Trannies are simple. They may have to get the other pots directly from Omeg as well. I don't think I've seen this particular style for sale anywhere. Thanks for that...... As an aside, who did the soldering??? Stevie Wonder?? Update: I've managed to acquire the blue 22uf cylindrical caps........ I've 20 of them if anyone is interested. Thanks for that... I've just found your post regarding your own PB. You have an early version with the 10k resistor. Can you tell me what the values of the circled caps are.. The polyester cap I can't make out the colour code. The tropical fish caps are the same as resistors only in pF. Taken from 1968 Mullard Data Book the bands are. 5 - working voltage, it just lists red as 250V d.c. but IIRC yellow = 400V d.c.
looks like the first 3 colours are red yellow and black.... 24?? Sorry, looked at your photo and didn't see the circles. Still a bit zonked out after last night's gig. To me it looks like a 0.22uf, the 2 red bands form one large one with yellow underneath. deltafred wrote: The tropical fish caps are the same as resistors only in pF. the small blue caps are 6.4µF, the small green one is probably a 4.7µF and the large green one is a 22µF. The exact value probably doesn't matter that much, electrolytics have fairly large tolerances, anyway. They used anything from 4.7µF to 10µF for the smaller electrolytics. Where would the 6.4uf, and the 4.7uf sit in the circuit above.....?? Just a quick question....... Any idea how big the PCB is?.... Like the actual size of the board? No idea. I could measure mine, but you might as well straighten a photo out in Photoshop and use caps and pots as a size reference.